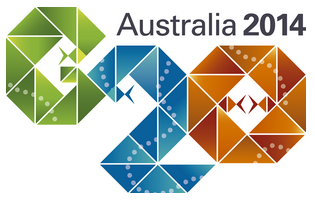 The G-20 summit was held in Brisbane, Australia on November 15-16. Leaders from some of the world’s largest economies and some international organizations got together to discuss how to improve our world’s economies. Some discussions were focused on increasing the quantity and quality of jobs for the nations’ citizens. There were talks about making trade amongst them easier. Plans were analyzed on how to make the financial system safer so that banks don’t collapse. Some people try to cheat at paying their taxes. Ideas were explored on how to share information so that the cheaters can be caught. G-20 sounds like the name of a robot from a sci-fi movie, but it simply stands for “Group of Twenty”. The members of the group are 19 countries (Argentina, Australia, Brazil, Canada, China, France, Germany, India, Indonesia, Italy, Japan, Mexico, Russia, Saudi Arabia, South Africa, South Korea, Turkey, the United Kingdom, and the United States) and the European Union. The G-20 was formed in 1999 after a financial crisis so that various countries could get together and work on the world’s economic issues. The nations in this group represent about two-thirds of the world’s population and 85% of the total value of all the products and services that are produced in the world. There are a few other “G”s out there. There is the G-8, a group of leaders from eight nations. It actually started as the G-6 but then Canada and Russia joined. This group should actually be called the G-7 right now as the membership of one of its members, Russia, was suspended in March this year because of Crimea. (You can read one of our past articles to learn about Crimea.) There is also the G-77, a group of developing countries which did start with 77 members, but now has 134! It decided to stick with its original name though, which was very wise, otherwise, it would have been changing its name every few months! Canberra is Australia’s capital. Brisbane is its third most populous city. The Story Bridge (image) is a landmark of Brisbane. It was built over 70 years ago. About 8 in 10 Australians live within 50 km (30 miles) of the coastline of Australia.